I cannot ignore the remarkable event near Slovakia–Ukraine border. Why? It is a Grand Opening of gas supplies from Slovakia to Ukraine. Prime Minister of Ukraine Arseniy Yatsenyuk, Prime Minister of Slovakia Robert Fico and Director for Internal Energy Market of the European Commission Klaus-Dieter Borchardt opened the commercial Vojany-Uzhgorod pipeline in Veľké Kapušany in Slovakia that was really an important event, a very important ... for Ukraine! It is no wonder that Prime Minister Yatsenyuk was quoted as saying that “we replaced 40% of gas, which we had previously bought in from Russian Gazprom, due to the opening of the reverse from Slovakia and opened opportunities for Ukraine to buy gas in Europe”. The nominated volume of a reverse supply of gas from the territory of Slovakia to Ukraine amounts to 27 mcm a day, or about 10 bcm per year. However as far as Europe is concerned, how is this event important for us? From the point of view of solidarity and other political incentives, everything is clear. And how is it important for us in view of coming winter? And also what does it matter in view of the dispute between Ukraine and Gazprom? And especially, how it is important under the conditions when there is not enough gas in the Ukrainian UGS in order technically to provide transit to Europe in winter season? But particularly interesting question is that whether our gas consumers in Europe understand what the gas reverse really means on the occasion of which this Grand Celebration was arranged? Sometimes the reverse is called "virtual". Why? Let's clear up in case of reverse whether the gas from Europe is transported in the direction of Ukrainian consumers physically in the literal sense of the word? I'll start with the most important - such a reverse can exist only when there are supplies of gas from Russia to Europe. And no other way! That is because just a part of the Russian gas after crossing the border between Ukraine and Slovakia then is rotated 180 degrees and is transported by the other pipe back to Ukraine. But upon arrival back on the territory of Ukraine, this gas is returned again into the transit pipeline directed to Slovakia. And by such a way this so-called reverse gas is pumped through a relatively small circle made with pipes and other equipment. It should be mentioned that the construction of "gas roundabout" cost 20 million Euro. It is noteworthy for us that European and Ukrainian policy makers call now these operations of whirling gas from Russia around the boarder as "diversification of supply." It is important that gas meters measure the volume of gas both on the way from Ukraine to Europe and on return way when it is coming back into the Ukrainian territory. In this situation the same physically gas can be taken into metering records of volumes of reverse and transit gas many times. But this gas only is circulating around the ring of pipelines and is not sent back to consumers in Ukraine, for whom it is allegedly intended. In fact, the reverse gas is impossible to transport technically in eastern direction further back to Ukraine, because there is no any gas transmittal pipeline in Ukraine running in this direction opposite from Europe. There is only a transit long distance transmittal pipeline delivering gas in one direction - to the west! You would ask how in this case the reverse gas is reaching consumers in Ukraine? It's very easy to explain since it is no means the same reverse gas. As a matter of fact instead of it another gas is taken out of the volume of TRANSIT GAS (!) in any place in Ukraine convenient to meet local needs. Thus, the "virtual reverse" in fact turns into legalized SIPHONING OFF transit gas intended for European consumers. This scheme reminds us how we transfer cash over long distances, for example, using Western Union services. Then it looks like as we put cash in one "pocket" of this company in order to get them back somewhere far away out of "another pocket." We mostly trust such a virtual cash transfer service as reliable but nobody expects to get back remitting cash out of "another pocket" more than a send amount. In contrast with financial services, the virtual reverse gas scheme in Ukraine causes a great concern. Properly speaking, this is exactly what today all of us are afraid of. Moreover, before now we felt ourselves the same, and there are certain reasons for it. Why? The point is that at present there are all prerequisites that the dispute between Ukraine and Russian Gazprom will not be solved in the near future. In this case, on the one hand, Gazprom will not resume gas supplies to Ukraine. On the other hand, Ukrainian UGS are not filled with gas at a volume that is necessary for simultaneous support of both domestic consumption, and transit to Europe. It means that in December Ukraine will proceed siphoning off the transit gas for its own needs deeper and deeper getting into a "virtual pocket" of the transit gas. In previous times it was illegal and was regarded as theft. 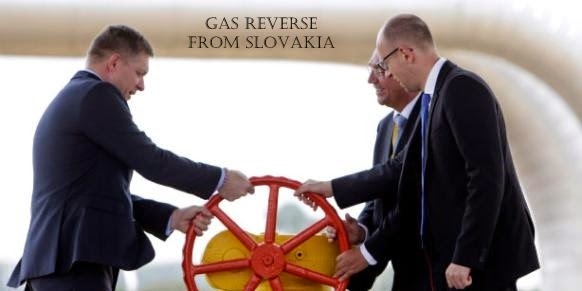 Now the European Union has legalized this scheme and officially inaugurated a reverse gas supplies from Slovakia! Of course, the first thought is that we could stop the reverse. Only the question arises whether is it possible? Let's see what do we know about the contracts? It was stated by the Slovak company Eustream that "according to Open Season procedure (binding of volume commitments for interstate transportation service of the reverse to Ukraine - Ed.) several European firms have provided binding bids for pumping gas through the pipe ...". However company Eustream refused to name these firms referring to a confidentiality of commercial transactions and only stated that their approximate number was from 5 to 10. It causes a big concern and a keen disappointment with that at present time, trying to please our Atlantic allies, we are deleting previous great efforts of our European business to establish long term relations with Russian companies, put off indefinitely conclusion of many prospective contracts, impeached the existing contracts in the energy sector, and in addition, as a backward result, created serious problems for our agriculture. And how much would it cost us to make one more effort in this direction of shutting down relations and to opt out of energy supplies at all? PS. As an epilogue, when this article had been already completed, it was reported that the volume of daily gas supplies from Russia to Europe reduced. Information from different sources is very controversial. Some sources have reported about a decline in gas supplies, and others said that everything is fine. But it is important that just those companies and countries which are dealing with the reverse gas to Ukraine have stated about gas supplies reductions. I have ventured to suggest that this problem, as mentioned above, is the result of the "legitimate" gas offtake from transit pipeline in Ukraine for their own needs in the volume exceeding the amount of reverse gas circulating at the border.